Available in basic as well as grooved feed barrel. Specifi c design of screw and barrel ensure the high production capacity. Accurate temperature control system ensures materials melting performance. Uniform throughout and melt temperature. RPM controlling by AC Drive (VFD). PlC controlled touch screen equipped electric panel optional. Stable wall thickness without deviation in thick or thin PE Pipes. Maintain uniform melt fl ow and homogeneous plasticizing. Available in M.S and S.S.
Automatic vacuum Control to maintain accurate diameter and roundness of pipes. Intensive cooling arrangement by using spray nozzles . Multiple tracks according to pipe sizes. Attached with Motor and AC Drive (VFD) for controlled speed of tracks. High friction rubber pads for tight gripping. 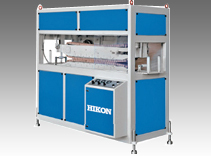 Automatic cutting system as per pre set length.